NBC Boston Investigators look at manhole explosions and state inspection. The NBC Boston Investigators are digging deeper into something you drive over every day, but what one expert calls "as powerful as a bomb." With so many manhole explosions in Massachusetts last year, why does it keep happening and who is overseeing it? Eric Brack had a close call. Back in 2004, an explosion in a manhole on Route 135 in Natick sent a 185-pound solid metal cover through the windshield of his father's Tahoe and crashing onto his chest. Then 18, the Holliston native and high school track star had to endure a dozen surgeries and a medically-endured coma to repair his bronchial system, his chest and his jaw. 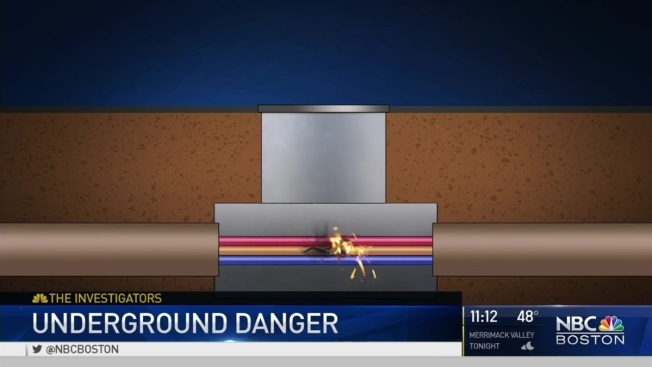 His injury, and others that summer, led the state to commission two reports on explosions in manholes and stray voltage, which can sometimes ignite toxic gas under pressure in a manhole. The state electric utilities must report incidents to the state and were required to inspect all manholes every five years. But the NBC Boston Investigators found that there was incomplete follow-up, and the utilities police themselves in reporting, inspecting and upgrading aging high-voltage electrical wiring. "There is no penalty mechanism associated with the companies' distribution safety plans, such as for targeted manhole inspections," Katie Gronendyke, a spokeswoman for the state Department of Public Utilities, which oversees the electric companies, said in an email. "Utility companies are ultimately responsible to maintain safe facilities." NBC Boston reached out to Brack, his father, and his attorney multiple times to request an interview. No one responded. The Bracks sued N-Star, which owned the manhole, and settled for an undisclosed amount in 2007. "I used to be able to run miles at a time cross country," Brack said at a news conference in 2004. "Now I can barely walk down the street. I get out of breath so quickly." The Investigators found that since 2010, there were 66 manhole explosions in Massachusetts. Most occurred in 2010, and National Grid, which serves much of the state outside Route 128 and north of Springfield, had the most, with 48. Eversource, formerly N-Star, reported five in that time, not counting two at Government Center in Boston last month. Western Mass. Electric, which is part of Eversource, reported 13, most of them in Springfield. National Grid said it did inspect all of its roughly 18,000 manholes by 2011, but it could not confirm that it had again since then. A spokeswoman, Amie O'Hearn, said the utility inspects every manhole it visits for any reason, and has set aside $7 million for cable replacement. Eversource said it inspected its 38,000 manholes, but over 10 years. Michael Durand, a spokesman for Eversource, said the utility, still known as N-Star at the time, asked the state for more time, arguing five years was not a reasonable time frame. Doug Sheff, a personal injury and fire attorney in Boston, said aging electrical infrastructure under old cities is a tragedy waiting to happen. "It's as powerful as a bomb. People can be killed," he said. Last month, an explosion flung a manhole cover into the air on Cambridge Street at Government Center, a spitting distance from Sheff's office. No one was injured. "And let me tell you, just in the case of Government Center, we just had a few events, and that should be a warning sign," he said. "Don't wait until one of these manhole covers decapitates somebody." The explosions most often occur when the insulation on the wiring fails, heats up and smolders. The burning creates a toxic, flammable gas that builds pressure under the manhole cover. A stray spark can ignite the compressed gas, flinging the cover into the air like a nickel. About a dozen explosions rocked downtown Brockton on July 1, 2016, igniting a dramatic fire that destroyed at least two cars. Brockton Mayor William Carpenter worked with National Grid, which created and executed a total inspection and audit of all its manholes in Brockton. National Grid replaced old wiring splices and junctures, and swapped out many of the solid manhole covers for the vented variety, which are designed to prevent gas and pressure from building. A smoldering junction on Warren Avenue last month amounted to just a lot of smoke. Carpenter said the new vented cover could have prevented an explosion there. "So it would appear the new manhole cover did exactly what it was designed to do, allowed the smoke to come out without any buildup of pressure, and this turns out to be today a relatively minor event," he said in an interview last month. "Simply a wire to some streetlights here." But without direct intervention like in Brockton, there is no statewide assurance that inspections are happening and that expensive upgrades are being made to infrastructure that can be going on 70 years old. "It doesn't happen a great deal, but I think as our infrastructure ages, it will happen more and more," Sheff said of the explosions. "[It] should be a concern, and prevent an injury or death instead of cause one."